At Fernandez Dental, we will welcome you as if you are a member of our own family. You will be treated as an individual with your own concerns and treatment specifications. We want you feel a part of your treatment, we will make every effort to answer all of your questions, and we will make you comfortable. Dr. Fernandez and our team enjoy making patients smile and boosting their self-confidence. 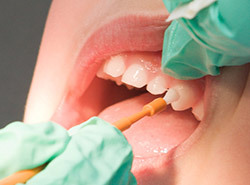 This is done on a daily basis, with composite (tooth colored) fillings and beautiful crowns. It is an art to provide such individual and functional restorations to our patients’ teeth. It is our goal that patients fully understand their treatment options. We use digital X-rays and photos to show patients the concerns we have with their teeth. With this information, Dr. Fernandez and our team will make suggestions for treatment as necessary. We welcome patients’ questions and are always available to answer any further questions that come up after an appointment. In addition to a variety of treatment options, we also use the latest materials and techniques possible for all of your treatment needs. Doing so gives us the best possible, most predictable results. A quicker appointment and visits that are more comfortable are a bonus! We are providers for Delta Dental (PPO & Premier), and Cigna dental plans. Each insurance plan is very different in their coverage. We will help in any way we can to help you understand your coverage needs. For treatment that is not covered, please ask about in-house financing options and CareCredit third-party financing. We are proud to provide general dental care to the greater Skagit Valley areas of Mount Vernon, Burlington, and Anacortes, WA. To learn more, schedule an appointment at our Mount Vernon dental office! A bridge is used to replace one or more teeth that are missing. Restoring your smile and the ability to bite and chew your food is an important use for replacing missing teeth with a bridge. It will also prevent movement of the adjacent and opposing teeth from drifting into the missing tooth’s place. A bridge consists of two (or more) anchor teeth or implants (abutments), and a suspended artificial tooth (pontic) taking the place of the missing tooth. The bridge is permanently cemented onto the anchor teeth. Bridges can be made out of full ceramic or PFM (porcelain fused to metal). In most cases, Dr. Fernandez can produce a solid, non-metal bridge, avoiding the gray line at the gum line that is seen in many bridges. 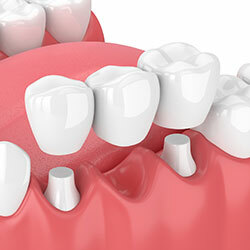 If the adjacent teeth have large fillings or cavities and would benefit from having crowns to restore, than a bridge would be preferred treatment. 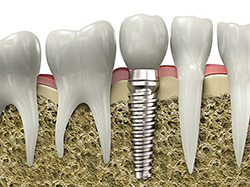 If the adjacent teeth are healthy, Dr. Fernandez may recommend an implant, as an implant will only replace the tooth that is missing, and does not involve any other teeth in your mouth. 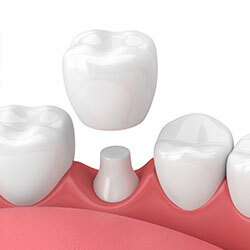 The procedure for bridge preparation includes removing a small amount of tooth structure around and across the top of the teeth that are to anchor the bridge. An impression, bite record, and shade of your teeth are taken and sent to a dental lab for fabrication of your bridge. If warranted, our lab will come to our office to create a custom, individual shade to match your existing teeth. A custom temporary bridge is created and cemented with temporary cement. It takes approximately two weeks for the fabrication of your bridge, after which you’ll return to our Mount Vernon dental office to have your permanent bridge seated. It is essential that you keep the area underneath the false tooth clean of food and plaque, as the crowned anchor teeth are harder to keep clean and more susceptible to decay. We will show you the proper way to care for your bridge and how to use the tools needed, including specialty floss and picks. You will also need to keep your regular visits with our hygienist to retain the health of your teeth and add longevity to your bridge. Dr. Fernandez offers several types of crowns that can be used depending on your needs. Full ceramic crowns are crowns that are made from different types of ceramic and have a very natural color throughout the crown. A porcelain fused to metal crown (PFM) is a crown that has a metal substructure and a thin porcelain outer layer, with very natural coloring. Our experience in crown procedures allows us, in most cases, to use a full-ceramic non-metal crown, avoiding the gray line at the gum line that is seen in PFM crowns. The procedure for crown preparation includes removing a small amount of tooth structure around and across the top of the tooth. This provides room for the cap to cover the tooth and fit with the surrounding teeth. We then take impressions, bite records, and note the shade of the surrounding teeth to be sent to our lab for fabrication. If necessary, our lab will come to our office to create a custom, individual shade to match your existing teeth. We will create a custom temporary crown to wear while your permanent crown is being fabricated. It takes approximately two weeks for fabrication of your crown. You’ll then return to our Mount Vernon dental office to have your permanent crown seated. Choosing Fernandez Dental for your crown is choosing an office that cares about you as a whole person, not just a tooth. We want you to be happy with your dental treatment, as we understand that having a beautiful, healthy smile is important to your self-esteem. Fluoride is a mineral that makes the teeth more resistant to acids from plaque that develop in your mouth. It also helps remineralize the surface of your teeth. Sensitivity in teeth is also reduced with the application of fluoride. Applied directly on teeth, topical fluoride is great for sensitivity and cavity prevention. It strengthens teeth for everyone of any age. Systemic fluoride, is taken in pill form, or is received via the water system. Systemic fluoride is important for children as their teeth are forming, as it helps teeth grow stronger and more resistant to decay. Currently, the only community in the greater Skagit Valley that fluoridates their water is Anacortes. Patients who live in Mount Vernon, Burlington, or other surrounding communities should talk to Dr. Fernandez about their fluoride needs. During your hygiene appointment at our Mount Vernon dental office, we will explain what type of fluoride would be most beneficial to you. We typically recommend Act Fluoride rinse, or other liquid fluoride rinse to general prevention. We may also recommend a prescription fluoride paste for stronger protection. Receiving fluoride treatment at Fernandez Dental gives patients a significant amount of fluoride in one simple application. Our new resin-based fluoride is less sticky than other fluoride varnishes, as it contains hydroxyapatite, which aids the fluoride binding to the teeth. Protecting your smile while playing sports is essential. Mouthguards serve as a “shock absorber” for your smile, guarding your teeth, lips, and gums from possible injury during physical contact sports. There are several types of mouthguards, most commonly premade, “boil-and-bite,” and custom made. 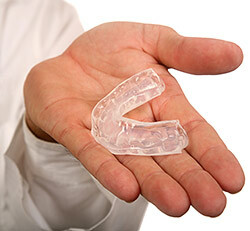 A premade mouthguard is a “one size fits all” type of appliance. It merely covers an athlete’s teeth and gives some buffer between the teeth and lips. 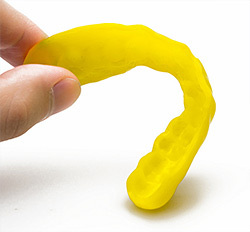 A “boil-and-bite” mouthguard is meant to provide some customization for this type of mouthguard. You can achieve this by placing the appliance in boiling water, then placing it into your mouth, biting down, and maneuvering your lips to create a general form of your mouth and teeth. This type of mouthguard is the same thickness throughout, which can make it difficult to talk and breathe for some athletes. A custom-made mouthguard from Fernandez Dental is individually made just for you. After taking impressions of your teeth, this type of mouthguard is custom formed to the models made of your teeth and gums. This type of mouthguard has different areas of thickness for superior “shock absorber” capability, providing the very best coverage, protection, and comfort. Failing to wear a mouthguard leaves you in danger of fracturing teeth and causing harm to other areas in the mouth due to injury. However, thanks to custom mouthguards at our Mount Vernon dental office, you can get a perfectly fitting mouthguard to leave your smiling—regardless of the score of the game! In the past, if you had a tooth with a diseased nerve, you'd probably lose that tooth. Today, root canal treatment, your tooth can be saved. A root canal can also present with no symptoms. When certain X-rays are taken during your regular checkups that show the root of your tooth, Dr. Fernandez can see signs of early abscesses that can be addressed before the tooth becomes painful. Root canal treatment has become very specialized, and today’s endodontists have specially designed instruments that make having root canal treatment quick and comfortable. If a root canal is necessary, Dr. Fernandez will refer you to one of our trusted endodontic specialists. During your root canal, the tooth will be anesthetized, just as you were having any other type of dental treatment. Your endodontist will then isolate the tooth and access the root of the tooth by making an opening through the crown of your tooth. They will then use small instruments to access the infected, diseased pulp chamber and roots of your tooth. These instruments clean and shape the inside of the tooth for filling. 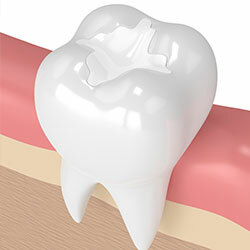 A filling material is then placed into the cleaned roots of your tooth, topped by a temporary filling. You will be instructed to return to our Mount Vernon dental office for your final filling or crown to complete your tooth’s restoration. 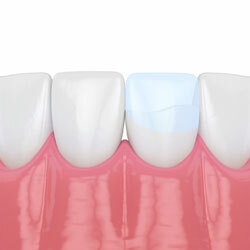 Dental veneers are thin custom shells, made from tooth-colored materials that cover the front the teeth. Dr. Fernandez recommends veneers to patients who have small gaps in between their teeth, misshapen teeth, or discolored teeth that do not respond to teeth whitening. Veneers are used to change the shade, shape, size, or length of a patient’s natural tooth in order to improve its appearance. If Dr. Fernandez determines that you are a good candidate for veneers, you will visit our office for tooth preparation. At your preparation appointment, a small amount of enamel will be taken away from the front of your teeth. 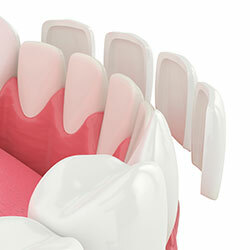 This will allow room for the veneer to be bonded to your tooth and provide a smooth surface. 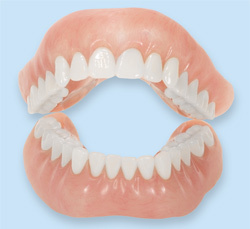 At this time, an impression will be taken of your teeth, allowing the lab to create your custom veneers. Temporary veneers will be placed on your teeth until you return to our Mount Vernon dental office to have your permanent veneers seated. On average, dental veneers last approximately ten to 15 years. They are prone to wear and damage, just as your teeth are. Proper home hygiene and regular visits to Fernandez Dental are required for veneers to reach their maximum life expectancy. It is important to care for your new beautiful veneers by avoiding biting your nails, sewing thread, chewing ice, fishing line, pencils, etc., which cause damage to your veneers. Grinding your teeth at night can also cause damage to your veneers, so Dr. Fernandez recommends having a custom night guard made to help protect your veneers and your smile. Wisdom teeth are also called third molars. They are the last teeth to appear in your mouth, usually appearing around the age of 18. Most people do not have enough room in their mouth for the wisdom teeth to come in properly or function. 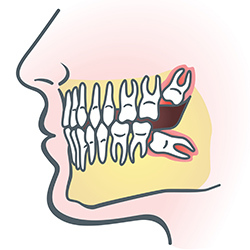 Often, these teeth are misaligned and need to be removed. Sometimes, these teeth can become infected and painful when they attempt to come in. This is also an indication that the teeth should be removed. After Dr. Fernandez determines your wisdom teeth need to be extracted during your appointment at our Mount Vernon dental office, we will refer you to an oral surgeon who specializes in removing wisdom teeth. They will consult with you and inform you of the entire procedure. In order to remove a wisdom tooth, your oral surgeon first needs to numb the area around the tooth with a local anesthetic. Since the impacted tooth may still be under the gums and imbedded in your jawbone, your oral surgeon will need to remove a portion of the covering bone to extract the tooth. In order to minimize the amount of bone that is removed with the tooth, your oral surgeon will often “section” your wisdom tooth so that each piece can be removed through a small opening in the bone. Once your wisdom teeth have been extracted, the healing process begins. Depending on the degree of difficulty related to the extraction, healing time varies. Your oral surgeon will share with you what to expect and provide instructions for a comfortable, efficient healing process.